The storage of knowledge is related to consciousness. Knowledge and consciousness are some of the most important 'phenomena' in understanding life. So what's the mechanism behind them? 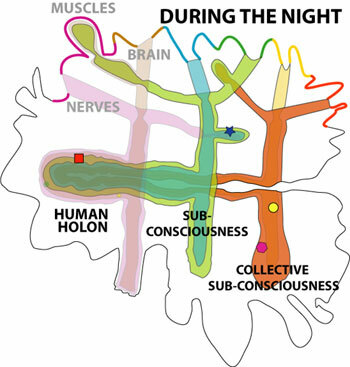 In next image this area is the central area of the human holon where ALL levels related with human consciousness are joined. In fact this is the TOTAL person. Although it seems visual that the person is 'smaller' than the further totality which you see on next images it i not. It's one of the perceptional paradoxes for our dimensions. The deeper level we touch the smaller they are ... but also the broader they reach. An example: the brain is large organ, the nerves-network is larger but smaller, the cells are everywhere but smaller again, the DNA is smaller again, the genes are just parts of DNA, etc. Now comes the general design. 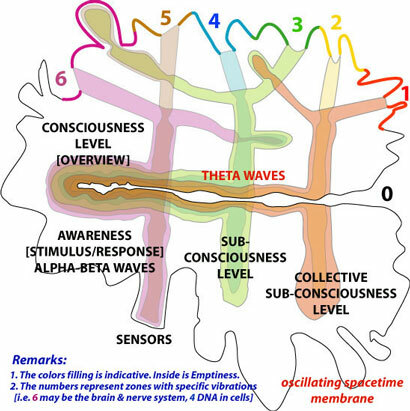 We see here an overview of the phenomena of awareness, consciousness, sub-consciousness and collective sub-consciousness. In our holistic approach they are all the time interacting with each other. Each has a higher number of interconnections with certain holon-levels of the body and is also connected with deeper holons by the unbreakable membrane. We humans are connected with all other cosmic events. We are interconnected by an unbreakbale and super elastic membrane. You can visualize above structure as the totality of a human. He is a holon. But that human holon receives "structure" from his historical ancestor-holons. For example the yellow Nr. 2 may represent the GENES STRUCTURE HOLONS. Although those genes are inside the human body they contain a pattern of previously structured spacetime geometry. Non-commutative. Yours and mine are different. We are unique. During the night our sensoring system is OFF. At those moments the signals (membrane vibrations) of the deeper layers are more clear because they are no longer over-powered. Then the deeper LOCAL knowledge and information of other NON-LOCAL holons may show up in DREAMS. What is then MEDITATION? 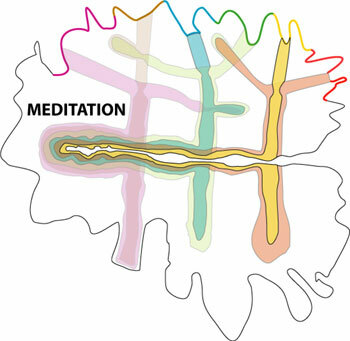 Real meditation is then when we exclude by focusing all sensor information (purple holons), and focus on the oscillations of the deeper layers of membrane. That makes us (as a totality) in harmonic resonance with those deeper layers and let us experience the universal vibrations (which are all the time in us). You can apply this design also on LIFE. The total membrane oscillates and it provides of course also the moves and changes of oscillation inside each holon. So we live by the moves of the total system. The moves of the Tathagata Womb (not a holon) create locally moves in the holons, in the sub-holons and their combinaties. 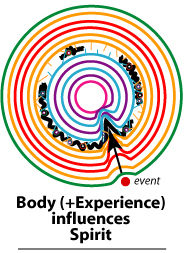 The essence of the basic interconnectivity of consciouness and life is caused by the interacting between the various spacetime layers inside us. And surface parts of these flexible layers have the possibility to enfold in smaller (local) multilayered spaces, which are sub-sets. These sub-sets store in their specific structure specific energy, so they vibrate in a unique way. They are like unique bells, each have their own sound, where that unique sound depends of the structure (properties) of the bell cup and the clapper(s). Several music instruments are made of the same basic material like a metal (bells, trumpet, saxophone, cornett, french horn, cymbals, ...) but have a different structure, and it's by this structure that each instrument can give unique (sound) information. So "information" is about "formation" or structure, and information is stored (inherent) in the geometrical structure of the system as long a the structure is respected. When the structure changes, then it's vibration (information) changes also. Mind and consciousness are about interface processes of "stored" in-formation, coming from two different type of energy levels, the physical body holon and the non-physical spiritual holon. In this topological holon approach we can see the humans as unions of body and spirit. Both are like multi-layered matrixes, where in each there are dynamic layers which are in constant move and change. So the matrix values are never fixed. However some parts of the surfaces are coupled / entangled in specific sub-holons. 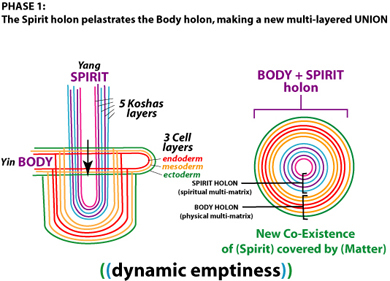 Based on the concept explained on the "life"-page, the spirit holon pelastrates (penetrates) the body holon, which has in principle three basic layers (endoderm, mesoderm and ectoderm). This results in a new multi-layered UNION of a spirit holon that is covered by the layers of the body holon. This is like a glove that covers the hand. Of course when the hand moves the glove moves also, and when you move the glove also the hand follows that move. Between the body and spirit holon is a kind of gap. Basically there is a pure membrane layer between them (see life-page). In the second phase, the phases of cleavage (cell divisions), sets of interface sub-holons are formed in the gap between the outer layer of the spiritual holon and the inner layer of the body holon. 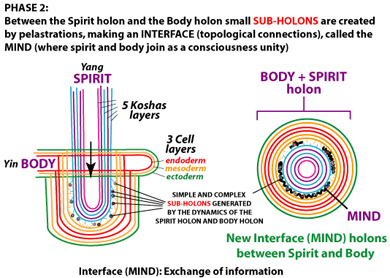 In these interface sub-holons layers of both basic holons are joined, where on/in these new spaces the vibrations of the spirit holon are translated in the body holon, and viseversa. This is the level where the spirit is aware of the activities of the body, and where the body is perceived as real and controllable by the spirit (the Will). This interface level can be called the MIND level, where the spirit is aware / conscious to be connected to a body, and the body is percepted as a part(ner) of the spirit. Your can imagine this level as a glue that connect on certain zones the glove to the hand. On this Mind level - similar to a computer screen, mouse and keyboard used as transmitting interfaces (1) to give software instructions to the hardware and (2) to receive hardware sensored information from the hardware (computer and sensors) to activate specific software programs - there is relative freedom of choice to activate the body in preferred way(s). If there is a large wart on the index finger, of course on that spot the surface of the glove will increase (deformation). (3) can provoke topological changes (sub-holons, deformations) in the spirit. 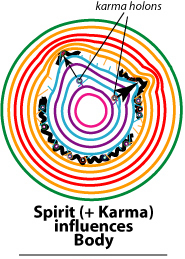 (4) can change the structure of karma holons, or de-pelastrate karmatic holons. 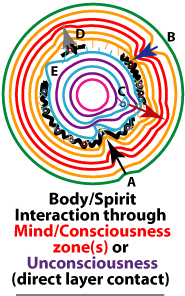 This image shows several actions between the body, mind and spirit. Changes in one of more layers provoke changes in contacting layers. Layers are never in rest, they are always oscillating. A. shows possible layer deformations caused by an external source / event, i.e. traffic accident. B. shows how an internalized event can cause effect(s) (deformations) on other layers, i.e. by eaten food. C. shows how a karmatic holon can deform organ development, i.e. chronical lung illness. 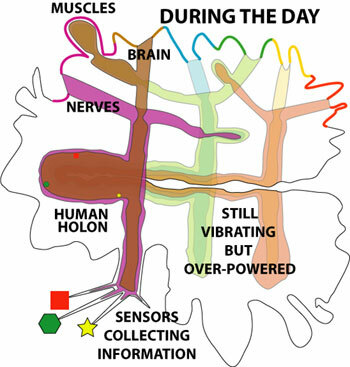 D. Sub-holons on the mind level can influence the layers of the body, i.e. yoga. E. The spirit and body layers can interact directly without passing through the mind layers. This is the level of the unconsciousness. Interactions happen, but unnoticed. On the decay of the human holon, the spiritual holon is forced withdraws while having inside a lot of karmatic holons (kind of memories) like a hand with a ring and wound. These karmatic holons may be harmonic or unharmonic. On reincarnation the spiritual holon penetrates/enters in a new body holon. 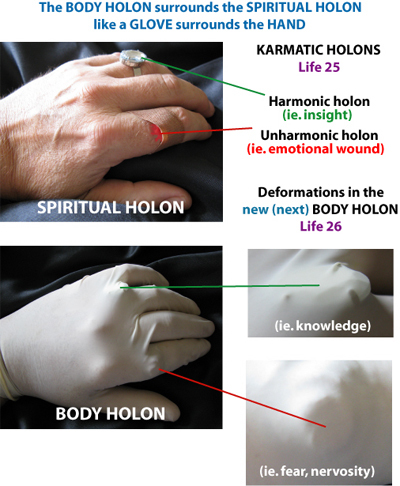 The energetic geometry of the spiritual holon will influence the final "shape" of the body holon, like the fingers with ring and wound will deform the shape of the glove. Above concept is a simple logic approach based on a single non-breakable membrane that can enfold in local multilayered unions. I hope this information brings you some vipassana.